Deoksugung, Jung-gu, Seoul, Sunday 15 September, 10:45am. By the time I reach the Deoksu Palace at 10:45am I’m already perspiring. I was wearing sunblock, but should have been wearing a sunhat and some shorts. It was going to be a hot day. This morning’s activity is a guided walk following the Sajik Daeje procession from the Deoksu Palace to the Sajikdan with the Royal Asiatic Society Korea Branch, and then to witness the ceremony itself. 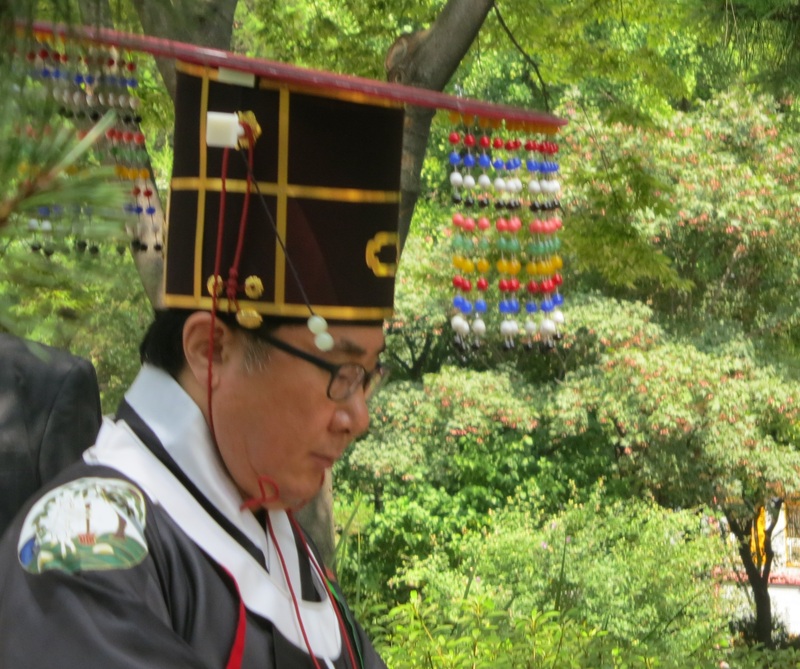 The Sajik Daeje, together with the Jongmyo Rituals, were the two great state ceremonies of the Joseon dynasty. While the Jongnmyo rites – being UNESCO registered – are state supported, the Sajik Daeje is funded by the remnants of the Yi royal family – the Jeonju Lee clan. But the occasion is no less splendid. Performing the sacrifices at the Jongmyo and the Sajikdan in the presence of his ministers and lesser officials, the Joseon monarch mediated between Heaven and Earth, between the dead and the living. 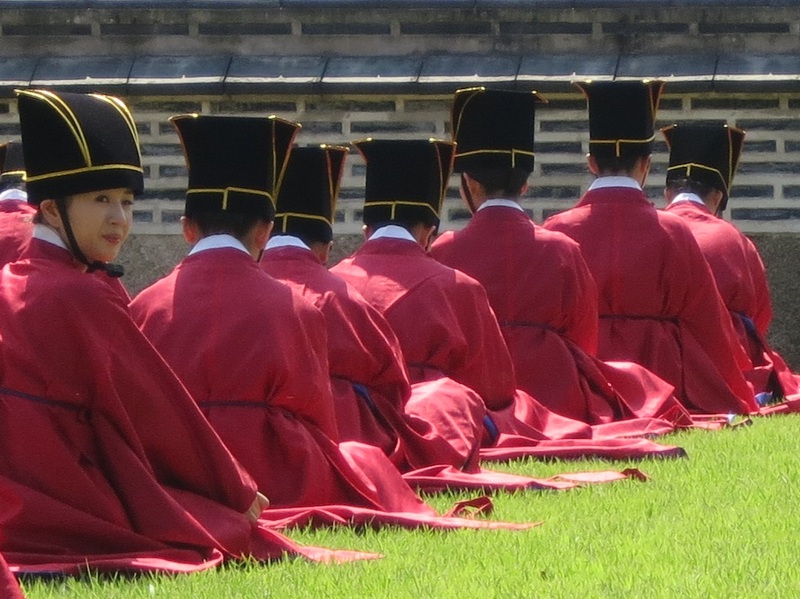 Through the act of invoking Heaven and welcoming the spirits of his dead ancestors at the Jongmyo, or invoking the gods of land and grain at the Sajikdan, praying for rain, the Joseon monarch affirmed his legitimacy, his responsibility for the welfare of his subjects (the moral criterion for exercising power), and the metaphysics of hierarchy that defined Joseon’s unique political and social order. Two entries among many which testify to the central importance of the Sajik rituals in the early Joseon dynasty. A network of subsidiary sajikdan altars were built in each province throughout the peninsula for smaller rites to be held, emphasising the connection of Korean people with the land. The national rites were once performed at the Seoul Sajikdan in February and August, and additional ceremonies were held on the site in times of trouble or drought, but they were banned under the Japanese. The ceremony was restored in 1988 under the guidance of the scholar in charge of the Jongmyo rituals, Lee Eun-pyo. The traffic in Sejong-ro is halted as the procession crosses from the palace to the east side of the road, then walks north towards Gwanghwamun. The RASKB tour group shadows it from the other side of the road, nosing around the flea market which is an innovation of the latest mayor of Seoul. 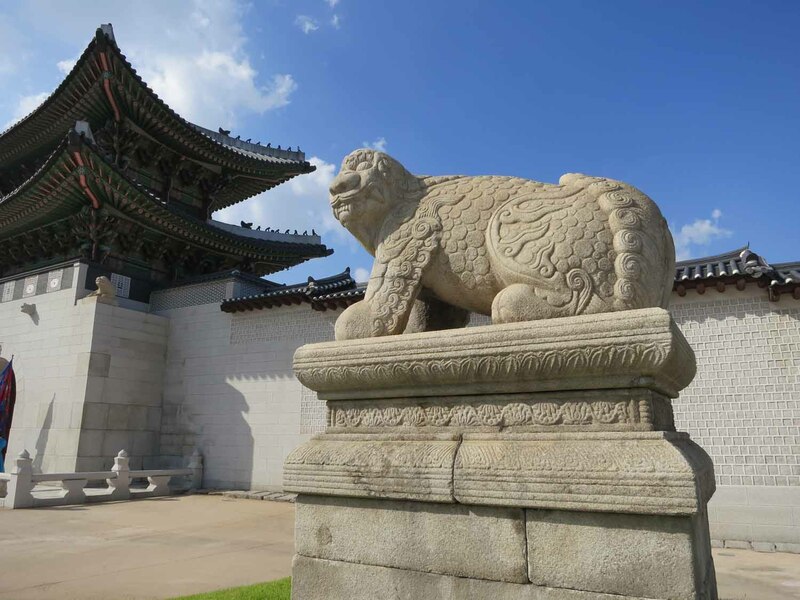 As we reach Gwanghwamun itself, our guide pauses to tell us about the stone Haecha – the fire-eating lions – which sit outside the palace on each side of the gate, there to protect the buildings against another conflagration. His voice is drowned out by a vocalist who is performing an Arirang for the benefit of tourists and shoppers alike. We make our way to the Sajikdan, just west of the main Royal Palace, the Gyeongbokgung. The positioning of the great national altars, as approved by King Taejo, follows Chinese tradition. Looking south from the palace, the altar for the ancestors (Jongmyo) is to the left (East) while the altars for the god of land (Sa) and god of grain (jik) are to the right (west). At the entrance to the park we are given little yellow paper pennants, signifying (we are informed) that we are guests of the Yi family, and we settle down to watch the ceremony, shading ourselves from the fierce sun as best we can. Goodness knows how the celebrants managed to survive the heat in their thick costumes. The ceremony is not a million miles from how I remember the Jongmyo rituals three years previously. Here, there are no ancestral tablets to be honoured. Instead, there are the twin altars for the gods of land and the gods of grain. The music is just as splendid, and the sixty-four dancers form an eight-by-eight square as they make their studied gestures and poses. mangryorye (final greeting and burning of ritual papers). We stay for an hour or so, long enough to get the gist, and head off towards Tongin market where we are due to browse round and have lunch. It is just before Chuseok, the early autumn festival, and the stalls are full of colourful rice cakes. I select a small food shack and have a spicy chueotang washed down with a large beer before walking slowly back to Insadong, trying hard not to become overheated in the sun.